It’s a simple thing, really, yet I have to admit it’s the #2 thing that makes me productive. It’s writing things down, five things a day. They are the top five things that I’d like to achieve in a day. If possible I put the hardest thing first. Once that’s out of the way then the rest is easy. This is the #2 thing. The #1 thing is seeking God. Every morning I ask God for direction for my day. I ask Him to guide my thoughts and my plans. I submit my day to him, and I know that whatever comes my way IS part of his plan. Sometimes it’s not easy. Sometimes nothing on my list gets done. Yet, it’s God’s list that matter’s most, whether it is taking my Grandma to the store or spending time hanging out with my kids. On other days part of my list gets done, and it’s a great feeling to mark those things off. So at least when I write them down I have a plan. But more important that that, I try to submit to God’s plan. The best one there is. What about you? How do you get things done? Share with me in the comments below! 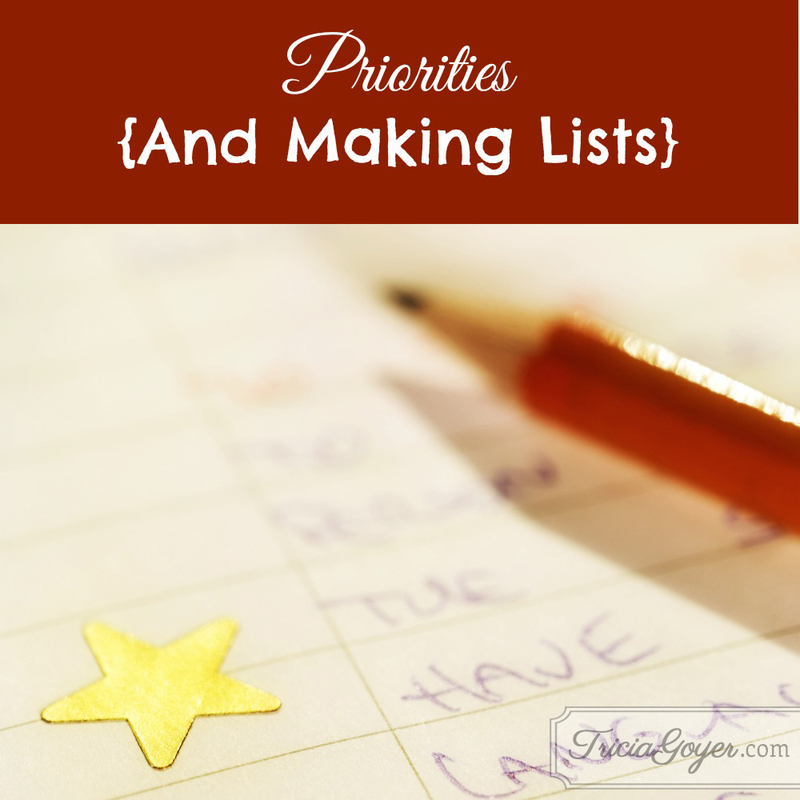 Thank you Tricia for your inspiration on organizing priorities while still keeping God first- My children are grown and out of the house, so I don’t have a schedule that involves all of the activities that involves raising children. Though my husband and I do have 2 large dogs that are our “children” which involves time and care. I make sure that during my long morning walk I have meaningful conversation with God, and incorporate reading devotionals while eating my breakfast. I too have lists that I work on tackling each day. As long as I make prayer my first priority, asking God for guidance as I walk through my day, I feel less “harried” and stressed and feel God’s comfort and direction instilled within me. I’m an active and easily stress out personality, and I surely couldn’t make it unless I was armed each day with God’s divine help. I’m not ever able to check everything off my “to-do” list, and if going to spend some time with my elderly father is what is needed on that particular day, the fulfillment that being with family provides is more important that the errand that I can just as easily put onto tomorrows “to-do” list. , This hasn’t always been easy for me, and I still fight the “I’m getting behind in my errands list”, though God is showing me which priorities are the most important, with him being first. God has really blessed my husband and myself and has answered prayers in opening my husbands eyes to his truth and his ways. just recently these past two months have been especially wonderful being able to have meaningful conversations together with my husband. I give praise and honor to the Almighty God our Father !! !